Yesterday was a bit awkward as companies and brands attempted to commemorate Armistice Day via fairly tacky Twitter posts. A silly Spartan and fictional characters like Metal Gear Solid's Solid Snake (since taken down) honouring other fictional characters sort of undercut the day a little bit. 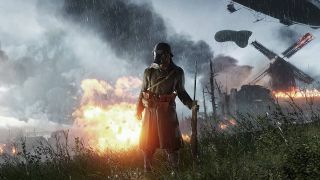 More meaningful, perhaps, was the brief ceasefire held in Battlefield 1. So on the 11th hour of the 100 year anniversary of the Armistice, a bunch of players took a break from their relentless war and just hung out on a beach. You can watch the brief break in the battle over on Reddit. Unfortunately, thoughtful commemorations require everyone to be on the same page, something that never happens on multiplayer battlefields. While players were putting down their guns on land, someone started firing on them from above. And then the person filming the whole thing got a bayonet in the chest.